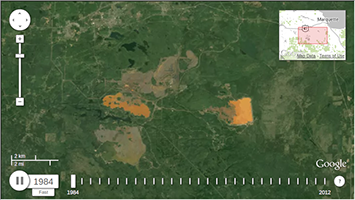 AmericaView Blog: Google Earth Engine Landsat Time Viewer: Now with Sharing! Google Earth Engine Landsat Time Viewer: Now with Sharing! 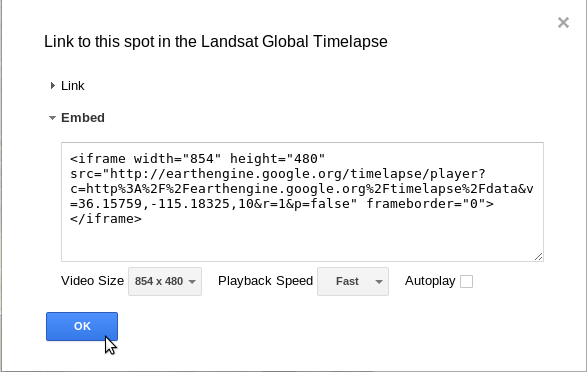 Some attention was given to Google's new Landsat Time Viewer, part of Google Earth Engine. The tool offers users the ability to look at the Earth's surface as a time series from 1984 to 2012 using their own web browser and Google Earth Engine's massive data catalog and rendering capabilities. Some of the example areas-of-interest are very compelling: Amazon deforestation, the drying of the Aral Sea, and urban growth in Las Vegas, Nevada. Now, you can embed a viewer for any part of the Earth's surface on your own website! Check out this example from MichiganView of an embedded viewer. It's extremely easy to get up-and-running. Just click the Share or Embed button once you've found a map extent within the viewer that you want to share! Unravel the shocking true crime behind of one of America's most infamous serial killers when Investigation.